Society of Preventive Psychiatry | SOCIETY OF PREVENTIVE PSYCHIATRY - WFMH, WASP MEMBER AND WPA AFFILIATE MEMBER. ΕΤΑΙΡΕΙΑ ΠΡΟΛΗΠΤΙΚΗΣ ΨΥΧΙΑΤΡΙΚΗΣ - WFMH, WASP ΜΕΛΟΣ ΚΑΙ WPA ΣΥΝΔΕΔΕΜΕΝΟ ΜΕΛΟΣ. 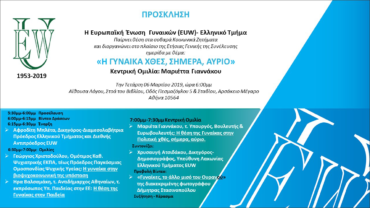 On Monday 1 April 2019 at 18:00 at the Secondary School of Penteli, 3 Tsakona Str., P. Penteli, a speech and scientific educational lecture will be held entitled: “PARENTS IN ACTION. ADDICTIONS AND THE ROLE OF THE FAMILY” with the participation of the Society of Preventive Psychiatry. Speech of the President of the Society of Preventive Psychiatry Professor George Christodoulou on “WOMEN AND BIO-PSYCHO-SOCIAL STATUS” on Wednesday 6 March 2019 at 18:00 at Stoa tou Vivliou. The meeting will include a keynote address by Mrs Marietta Giannakou, former MP, MP and MEP on “THE POSITION OF WOMEN IN POLITICS YESTERDAY, TODAY, TOMORROW”, along with speeches by Mrs. Hera Valsamaki, former Deputy Mayor of Athens, former Representative of the Ministry of Education in the EU on “THE POSITION OF WOMEN IN EDUCATION” and by the President of the Society of Preventive Psychiatry Professor George Christodoulou. The 23rd World Congress of Social Psychiatry of the World Association of Social Psychiatry WASP will be held on 25-28 October 2019 in Bucharest, Romania. The Society of Preventive Psychiatry SPP is a Member Society of the World Association of Social Psychiatry WASP. The Administrative Board of the Society of Preventive Psychiatry decide to draw up and amend the rules and regulations of services and departments as well as the way these operate. The Administrative Board of the Society of Preventive Psychiatry decides on setting up different committees necessary to put forward the Society’s work. The administration of the Society of Preventive Psychiatry is to be carried out by: The General Assembly of Members of the Society of Preventive Psychiatry. The Administrative Board of the Society of Preventive Psychiatry.